Subject: Meeting of the National Anomaly Committee -regarding. 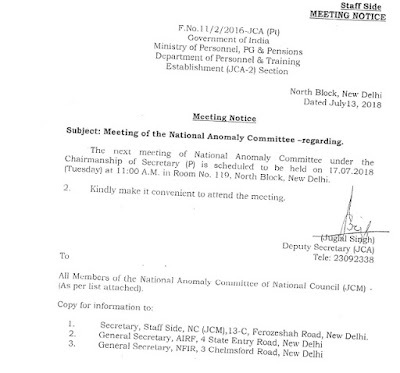 The next meeting of National Anomaly Committee under the Chairmanship of Secretary (P) is Scheduled to be held on 17.07.2018 (Tuesday) at 11:00 A.M. in Room A. 119, North Block, New Delhi.